For me, there’s always a fine line between having fun and “about to go crazy” with DIY. I got this idea from Supermom. 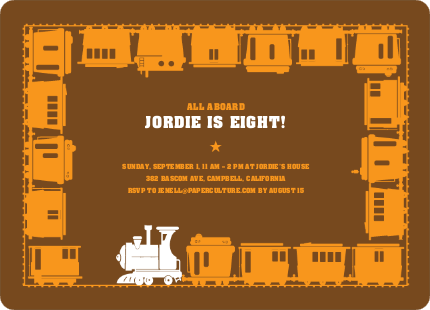 I usually like to order custom invites but we were taking Easy Street for our baby boy’s train themed birthday by just having our immediate family over to celebrate. I still wanted to put something in the mail though! We were sending 10 invites so a fill-invitation would have been just fine, however that’s against my natural grain because I love paper and design so much. 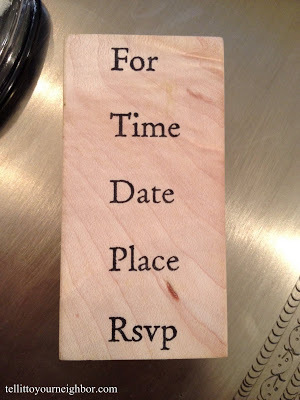 Maybe I could create an original fill-in invitation with stamps! 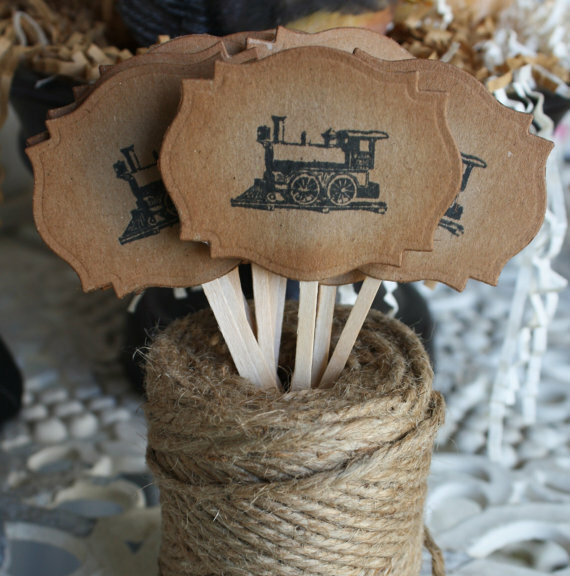 I headed to Paper-Source (a place I frequent by foot and by finger so I pretty much have their inventory stored in my head) to get their “For Date Time Place” rubber stamp and I was sure they had a train stamp. 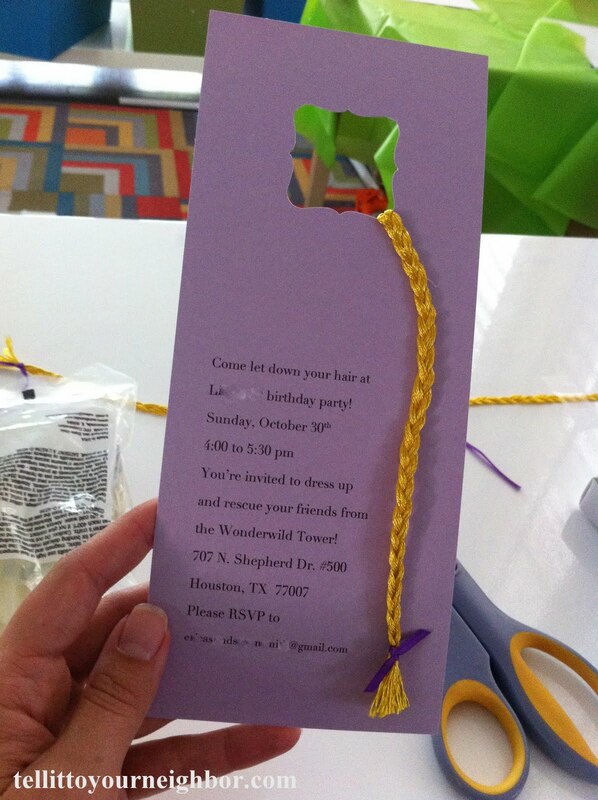 Create your own fill-in invitation, this is Easy Street, tell it to your neighbor! 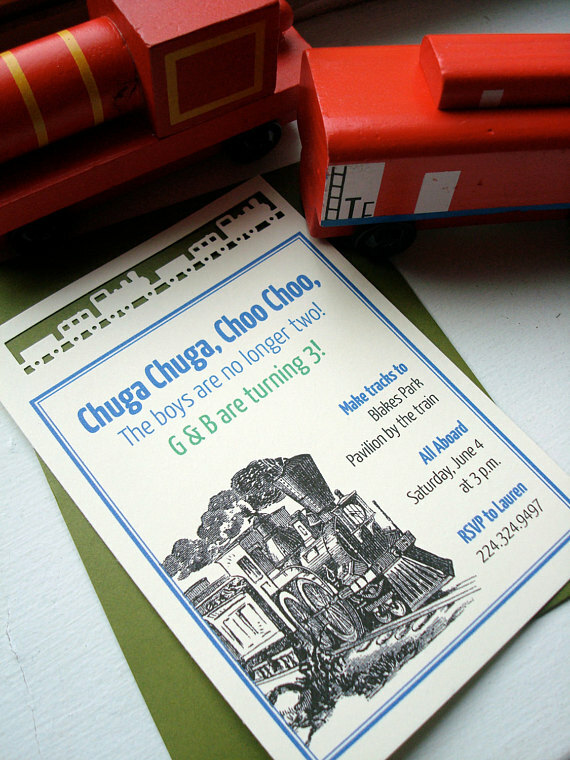 For a quick, no stress, hand written invitation, I love the way the DIY fill-in train invitation turned out! I had so much fun, I think I’ll do it again! 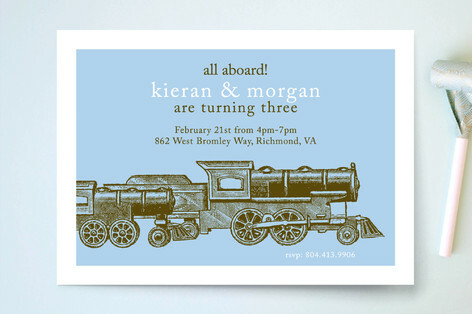 I embossed the train and the “for time date place stamp” so they’d be more opaque and for some dimension. 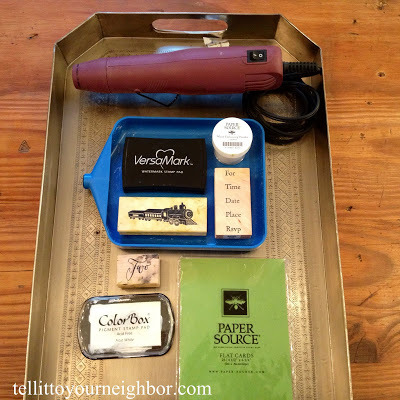 Embossing is pretty simple, almost as easy as glue and glitter, the only difference is you have to heat up the “glitter” with a blow dryer type tool. 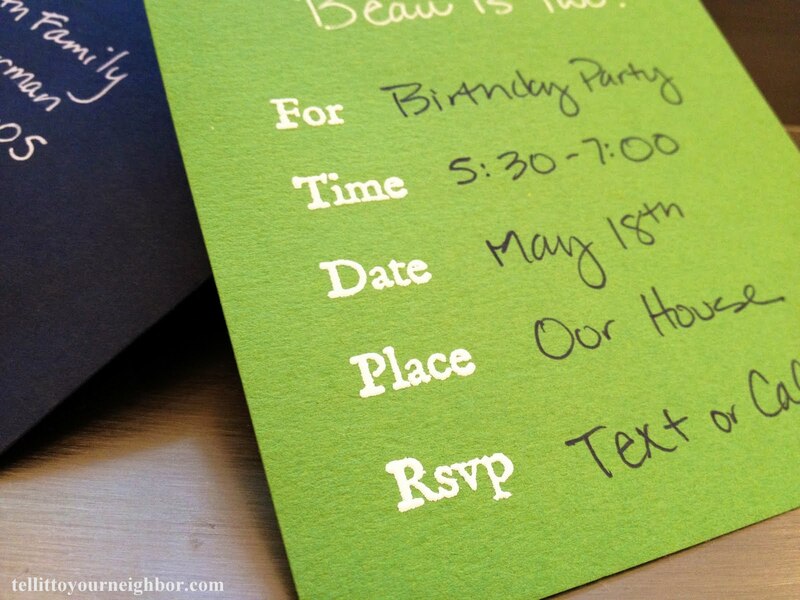 Here’s how to emboss: use a watermark ink pad, stamp image on paper, pile embossing powder over image, pick up paper with both hands (keep it flat) and vibrate paper for full coverage, dump excess powder, turn on embossing tool, aim at image, hold it about 5 in from paper and move tool in a circular motion. Watch the magic as the powder melts! 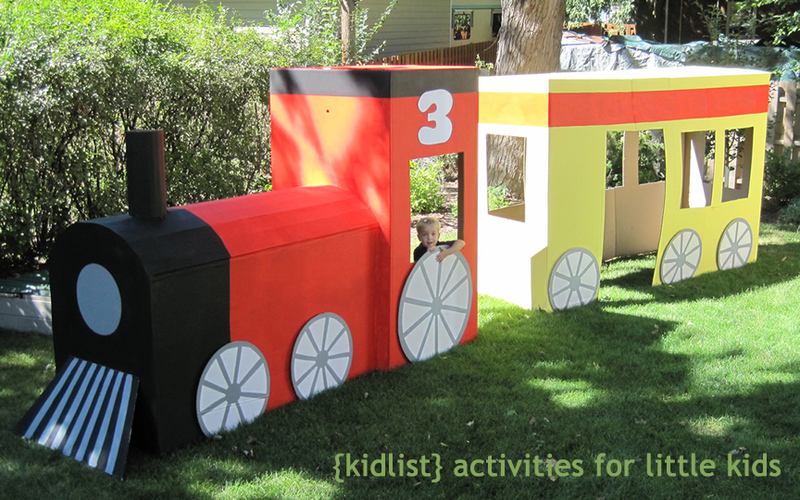 Here’s everything I gathered for ideas and inspiration before deciding to go small on our boy’s train birthday party. Somebody should use it, I think it’s cute stuff! Wow! A train made out of refrigerator cardboard boxes.